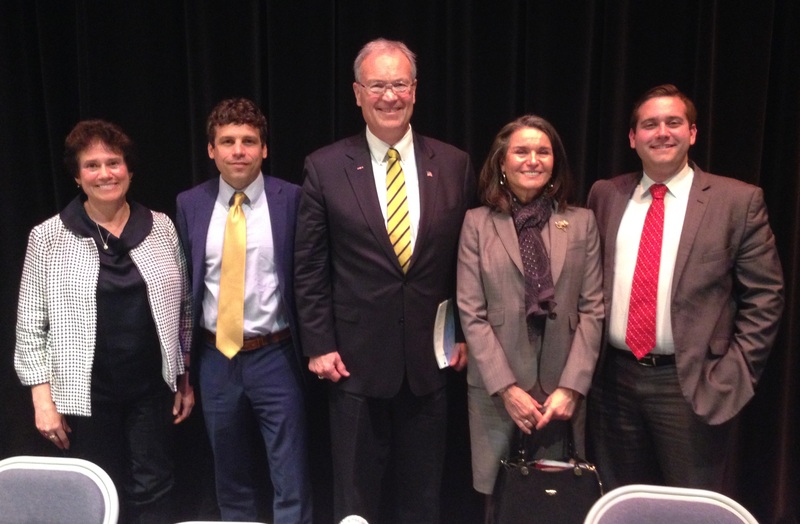 The candidates who will appear on the Democratic Party Primary on June 26 (from left to right): Tracy Mitrano, Ian Golden, Max Della Pia, Linda Andrei, and Eddie Sundquist. MAYVILLE, NY – An estimated 150 people were on hand Wednesday night for a Meet the Candidates forum featuring the five candidates running for the Democratic Party nomination in New York State’s 23rd Congressional District. The event took in the Chautauqua Lake School Auditorium in Mayville, NY and was hosted by the Chautauqua County League of Women Voters. The five candidates are Linda Andrei (Ithaca), Max Della Pia (Owego), Ian Golden (Ithaca), Tracy Mitrano (Penn Yan), and Eddie Sundquist (Jamestown). Throughout the two-hour forum, the candidates fielded more than 15 questions from the moderator, audience members, and from each other. They covered a wide variety of topics, including Economic Development, Alternative Energy, The 2nd Amendment, The Environment, and Education. The NY 23 Congressional District, containing: Chautauqua, Cattaraugus, Allegany, Steuben, Chemung, Schuyler, Yates Tompkins and Seneca counties – along with a portion of Ontario county. The 23rd District is currently held by Republican Tom Reed (R-Corning) – an entrenched incumbent seeking his fifth term in office and who has won reelection by double-digit percentage points the past two elections (15.2 in 2016 and 21.9 in 2014). Much of the evening’s criticism was focused on Reed, including his record on economic development, or attack ads that label all five candidates as “extreme liberals”, or the amount of campaign donations he receives from interests outside of the district. When the candidates were given the opportunity to question each other, Mitrano received the most attention, with each of the other four candidates challenging her and asking for clarification on everything from her residence (“Is it Ithaca or Penn Yan?” Golden asked) to comments she made in the past. At one point Della Pia asked her if she would remain on the ballot in November as a Working Families Candidate (whose endorsement she has already received) even if she doesn’t win the Democratic Party primary. Mitrano would only say she would cross that bridge if and when she comes to it. The focus on Mitrano could be due to her running a strong primary campaign. She collected the largest number of signatures from party members out of any of the five candidates in order to get her name on the ballot. She’s also placed in the top 3 of various straw polls that took place late last year and earlier this year. The Demcocratic Party Primary will take place on June 26. The winner will square off against Reed in the November General Election. The Cook Report currently rates the race as Solid Republican.